Trying to catch shore birds is a matter of hurry up and wait, hurry up and wait. Setting the net needs to be done as quickly as possible, camouflaged, and attached to the cannons and then left. Sometimes the birds need to be encouraged to move into the catching area - twinkled as we call it. But for the most part it’s just a matter of sitting and waiting, sipping bitter flask coffee. The crackle of radio messages - “25 birds in the catching area”, “What just put the birds up?” “Peregrine”, “Arm” “three, two, one - fire”. All hell breaks loose when the small red button on the firing box is finally pushed. Such a small button, such a lot of action. Birders, normally a sedate (some would say sedated) and reserved lot, now in the guise of banders, sprint for the net. Most put in an Olympic A qualifying time, many pull muscles, some lose their shoes, some fall and lose their dignity. A few years ago I broke a toe dashing towards a net of damp birds, but only found out about it a few hours later, after the birds had been processed and when the excitement levels had fallen. It really was rather painful, but for the best part of two hours I’d failed to notice. The birds in the net are nonplussed to say the least and are telling us so with every call, squawk and whistle that they know. A net full of birds - many, many birds - is no place for the faint of heart. Orders, not requests are given, and the prime, the only, concern is for the birds. If you are likely to take offence at being told to move faster, pull harder or to stop gauping, then this is no place for you. The birds come first and ego a distant second. Standing on the net is a possible death sentence for the birds, and a certain one for you. There are few certainties in life, but not standing on the net is one of them. A dry catch is preferable, but a wet one is much more common and much more work. On some catches it pays not to look at what you are kneeling in as you extract the birds. Once extracted from the net the birds are placed into small, dark keeping cages where they wait with surprising calm. To see the faces of people who have never held a wild bird before is to see something close to a childlike happiness in many adults. A kind of happiness that seems to grow from the wonder of what they are actually doing down here by the sea, here in the mud and sand. A kind of happiness that grows from the nearly miraculous stories that these birds have carried with them from far, far away. Smiles widen as Knot, Godwits and Stints are passed from the hands of the extractors to the “runners” moving the birds to the cages. The runners hold the larger birds with a kind of surprised reverence. They offer the birds to the keeping cages with the same look of concentration I saw on the faces of the people who were running communion when I was forced to sit through endless Chapel services - an unbeliever in the pews. But these birds have not undergone any form of transubstantiation; they were wild at the start and remain wild to the end. If there is a truth here, it’s that while you can hold a wild thing in your hands, you will never know the true wildness it knows. There may well be salvation in wildness, but you can’t find it if you hold things captive. Once the blood pressure of both banders and birds has returned to the normal range, the next stage begins - processing. Here the birds are measured, weighed, banded and in this case flagged. A range of biometric measurements are taken - bill length, combined head bill length, wing length (but not if the outer primaries are moulting), weight - these are all taken and logged. The state of the feathers is minutely scrutinised to age the bird. A small metal band (ring in the UK) is put on the left leg and an orange “leg flag” on the right. Orange means SE Australia - see a bird with an orange flag and it could have passed through my hands. Retraps, or controls, always cause excitement, but often they are recently banded birds. In many ways this is reassuring, as it means the birds quickly recover from being handled. In fact it always surprises me how many flagged birds you can still see, feeding on the tide’s edge or washing their feathers, just meters from where we are processing their flock mates. But if the looks on the faces of the people who have never held a bird are remarkable, then the stories that the weighing, measuring and retrapping reveal are doubly so. The migration of birds must have always played a part in the world of humans. Spring returns and autumn departures would have marked changes from famine to feast, from cold to warm. Migration was nature as augury. Even today this aspect may not be lost: people still write to the Times on hearing the first CXuckoo, Ted Hughes still sees the return of spring Swifts as a sign that the “world is still working“. Cranes. Geese. Winter Thrushes. Humming birds. They all come and go and we seek to know why. People have always invented stories to explain where the birds go. Gilbert White, whose book started all of this, thought that Swifts and Swallows hibernated in the mud at the bottom of ponds, but he was wrong. What we were doing on the beach, was helping resolve the truth of the matter. These birds spend their non-breeding time in Australia, and breed in the northern hemisphere - they are like sun seeking tourists, maximising the daylight. Of course the language of such travel is difficult; these birds are not over wintering in Australia. It can be 40oC, there can be weeks without rain, so this hardly counts as winter - having said that what we have just been through in Australia hardly counts as a summer either. Now these birds undertake a north south journey of staggering endurance and distance. The birds that come to SE Australia breed in Alaska - which in terms of Melbourne to Anchorage is over 12,400 km away from the beach where we caught them! 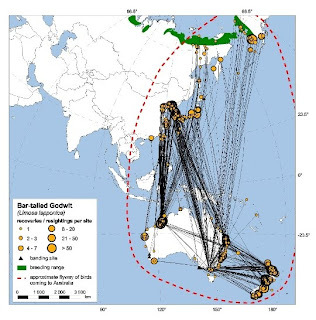 Before they do this journey many immature birds will have gone on a relatively short “day trip” across the Tasman Sea to New Zealand - a mere 2600 km! These journeys are completed by a bird with a mass of no more than 600g for a large female. This is the same mass as a couple of large apples, less than a family sized pizza, or 10 mars bars! And yet they fly to Alaska. Now this would be remarkable enough if they did it in a series of short hops and skips - a little bit here and a little bit there. But no, that’s not good enough for our Godwits. They fly from Australia to the South China Sea more or less in one go, then feed up again before heading for Alaska. Impressed yet? Well I hope you’re sat down. On the return journey they fly over the Pacific in one go - all 10,000 km and 8 or 9 days of it. 70-80 km an hour for hour after hour after hour. It’s the longest known non-stop migration flight of any bird. If you take the round trip to be 20,000 km our oldest know bird (24 years old) has flown 480,000 km just on migration. This does not include the flights when it pops down to the shops for food or has to fly away up the beach because it’s been disturbed by banders! Now 480,000 km is more than the distance between the Moon and the Earth. I’m running out of comparisons here - but I need you to be impressed! And on a surprisingly chill January morning I sat on a beach in Australia and weighed and measured one of the greatest travellers that evolution has produced, knowing that in a few months it would be off north again. Pulled by instinct and the spin of the Earth through space. Of course the birds come to Australia to fatten up, to put on condition to allow them to breed the next year. So they feed on shrimps, beach worms and such like and store the Australian sunlight energy that has passed along the food chains and take it back to Alaska, via China. I suppose it’s just another form of mineral export. You very quickly begin to tell the bigger females from the males - they are a real handful and their beaks can be longer than the whole head and beaks of the males. Rather annoyingly the female’s head and beak length can be longer than the callipers we use to measure them with as well - these are not small birds. They are weighted by being placed in a plastic tube and after being banded and flagged are released into the wind, back down to the waves where they wash and start to feed. It’s a remarkable feeling knowing that when we are in our coldest months, these birds will be in the far north with hour after hour of sunlight in each day, and only instinct to bring them back to this beach. As we walk away from the beach a kind of calm settles; the Godwits, all legs and stick thin beaks, the plump and dumpy Knot and flighty Stint, scatter and regather at the water’s edge. Joggers pound along the firming sand, dogs run and sniff. The normality of an Australian beach morning returns, with only scuffed sand and a few orange tagged birds to show that we were there. If, on your journeys around the world you happen to meet a Godwit with VJ on its leg, say hello, wish it good luck, and then let me know. Not since watching "Winged Migration," (or as it was known in Australia where we saw it first--"The Travelling Birds: An adventure in flight,") have I been as awed by the endurance and perseverance of nature. You put a face on the migration even better than the film. Thanks. Rich B.
Amazing distances to cover - incredible that they evolved to do so, to keep chasing summer and food. Another wonder of the world - thanks Stew. Hi Stewart, this is a very interesting post. I just wish I could see and maybe participate sometime in the flagging of birds. I was involved - in an unusual way - with the first godwits satellite tagged in NZ. A number of them lost their satellite transmitters (or whatever you call them!) and dropped out of sight. A few days later we found one of these birds right around here and photographed it as well. This was the first anyone knew of what had happened to it. It had lost everything except the leg flag but this clearly ID'd it. Later that year it was sighted again in NZ where it had been caught and tagged. Of course since then I have been very interested in finding any other flagged birds. Thanks for dropping by my Blog, and introducing yourself. Nice to hear from you. I grew up banding birds with my father, Steve Wilson, in Canberra. Mick and I often swap notes too. It came from Corner Inlet, so maybe we have been linked metaphorically already. I would like to add your blog to my list of "Aussie Nature Bloggers" in my Blog side-bar. What wonderful pictures of the beach - and all those birds! I'm overwhelemed - what a great, informative post! I've seen small land birds banded, but never the waterfowl or any birds as large as this. I think that the wonder and joy of holding a wild thing for a moment must be much the same. Stewart, thanks for visiting my blog and giving me the link to your post. What a story! It's beautifully written, inspiring and spell-binding! You are reminding us of an unspoiled world that has been in existence for millenia untouched by human transgressions. Thank you for sending me over here. Totally amazing stuff! When I first started reading, I immmediately wondered why anyone would try and catch birds. It didn't dawn on me about banding them. Question...how do you (birders) come to the conclusion that there is no stopping on the way back to Australia?